The Kuranda Tree Frog breeds on small streams in the bioregion of the Wet Tropics World Heritage listed rainforest in north Queensland, Australia. The conservation status for Litoria myola, under the classification of the International Union for Conservation of Nature (IUCN), is Critically Endangered and Endangered under the Australian Environment Protection and Biodiversity Conservation Act 1999 (EPBC Act). 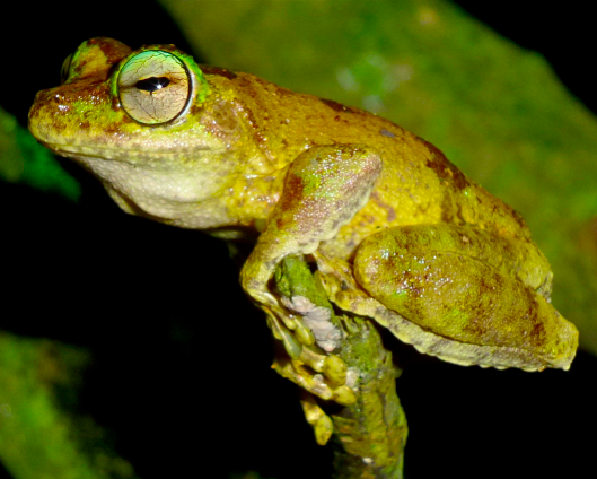 The Common Mist Frog (Litoria rheccola) and the Lacelid Frog (Litoria dayi), otherwise known as Lace-eyed Tree Frog (Nyctimystes dayi), are both listed Endangered under the IUCN and the EPBC Act shared the Kuranda Tree Frogs habitat. However, the later frogs have not been identified in the last decade. There are two classifications listed before critically endangered; Extinct in the Wild and Extinct (find out more). These classifications are due to the very small total population and fragmented distribution as well small breeding populations of which thirteen are known. Only small portions are protected in conservation areas, the rest is largely on private land. Therefore, conservation of these species depend on the Frog Friendly [Link to book] activities within the community in the Kuranda region.